Honda Motorcycle & Scooter India Pvt. 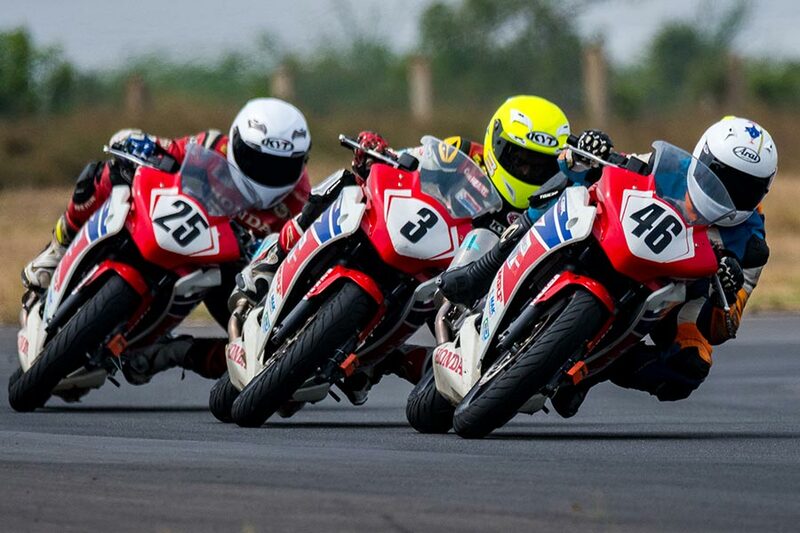 Ltd. (HMSI) is all set to rev up the motorsports season with the tenth edition of the Honda One Make Race at Coimbatore. Motorsport enthusiasts are all set for an exciting weekend from June 9 onwards, marking the beginning of the motorsports season as Honda leads the racing culture with total of 80 entries across India. The three new categories of National Championship will see India’s best racers racing on the CBR 150R. Honda’s arsenal in the Super Sport Indian 165 (modified) category will be led by Rajiv S (Participant- 250RR ARRC Championship 2017 and Pro-Stock 165 Champion 2016) and Mathana Kumar (250R- HOMR Championship 2016). The Pro-Stock 165 (Open) will witness 4 CBR 150R’s on the grid while Stock 165 (Novice) will have 4 racers leading the battle on the grid. Honda’s flagship CBR 250R Team Championship will see intense competition between 20 racers, 4 teams (Apex Racing, Ten 10 Racing, Pro Lap Racing and Rock Star Racing). The grid will boast of India’s top notch racing talent including Rajiv S, Anish D Shetty and Piyush Ranjan among others while CBR 150R category will see participation from 40 riders, who have undergone extensive racing training from Honda Ten10 Racing Academy or any other training school recognized by MMSC (Madras Motor Sports Club), to vie for the top-spot. After the grand success of the first-ever full-fledged season of the Honda All Women Race, 2017 edition promises to be an exciting sequel. 8 woman riders, trained at the Honda Ten10 Racing Academy, will be competing in the First Round of the Honda exclusive women racing event. The category will be lead by Ryhana Bee (Winner- Honda One Make All Ladies Race- 3rd round, 2016 and 1st runner up- Honda One Make All Ladies Race 2016) and Shruti M (2ndrunner-up- Honda One Make All Ladies Race 2016). Honda has been successfully promoting motorsports and continues to expand safe fun biking culture in India. Over the years, we are delighted with the overwhelming response to Honda One Make Race and 2017 promises to take the excitement to the next level. At Honda, we are delighted to enable youngsters pursue a career in the high adrenaline world of motorsports. Following an encouraging response from participants, and support from the motorsport fraternity, we are continuing to promote women riders with our Exclusive Women Race. Meanwhile, both the CBR 250R and the CBR 150R categories, continue to emerge as a nursery for young talent to showcase their potential. Developed with technical know-how provided by Honda’s Indian R&D team, both motorcycles are set to scorch the Madras Motor Race Track beginning this weekend. The new racing version of the CBR 250R got an upgraded Honda racing kit, including wiring harness with remapping option, advanced racing body cowl kit and equipped with endurance exhaust. The new CBR 150R gets a reprogrammed ECU. The next round of Honda One Make Race is scheduled for 08-10th July 2017 at Madras Motor Race Track, Chennai.